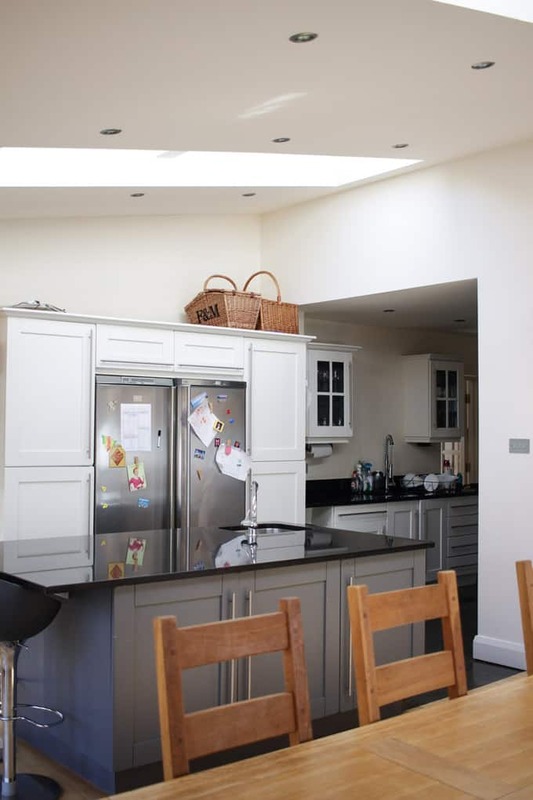 A grey kitchen, including wooden cabinets painted grey, bi-fold doors, Velux roof windows, an Instagram photo gallery wall, black tiled floor, wooden floor, huge island unit and heaps of other ideas for monochrome kitchen and dining areas. We bought this house by accident. We only came to have a peek. Inspiration, for what we could do to ours. And then we walked into the kitchen. 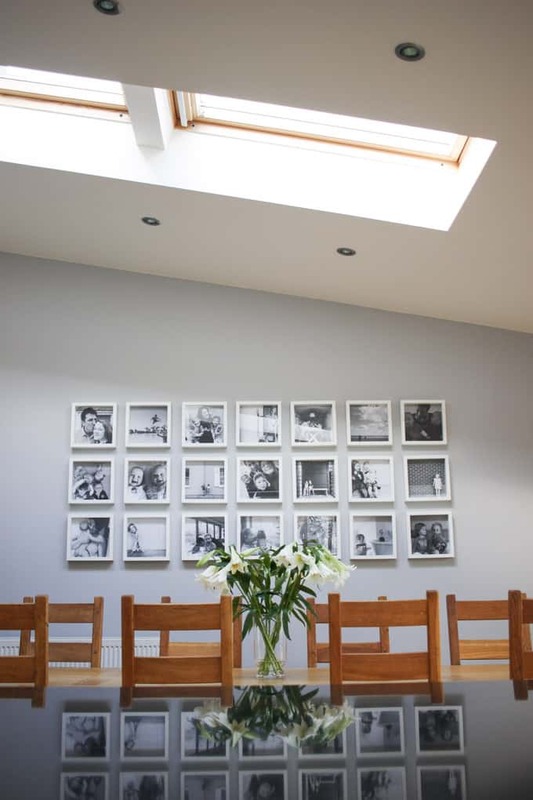 The house was a definite compromise, it wasn’t quite in the position we wanted, but we decided to go for it, all because of how much we loved this space. Ten years later and we’re still here and still loving this kitchen. Lots of my YouTube viewers (hi!) have asked for a tour of our grey kitchen, but I’ve always been a bit embarrassed. It felt a bit naff somehow, like maybe I would be showing off. But then a couple of weeks ago, Velux got in touch. 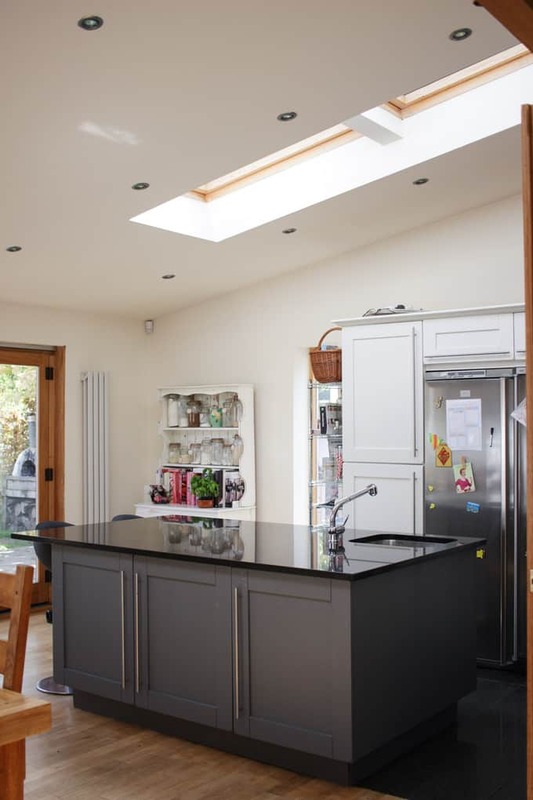 They saw a photo of our kitchen on Instagram I think and asked me to share what effect having VELUX roof windows in our kitchen had on our lives. 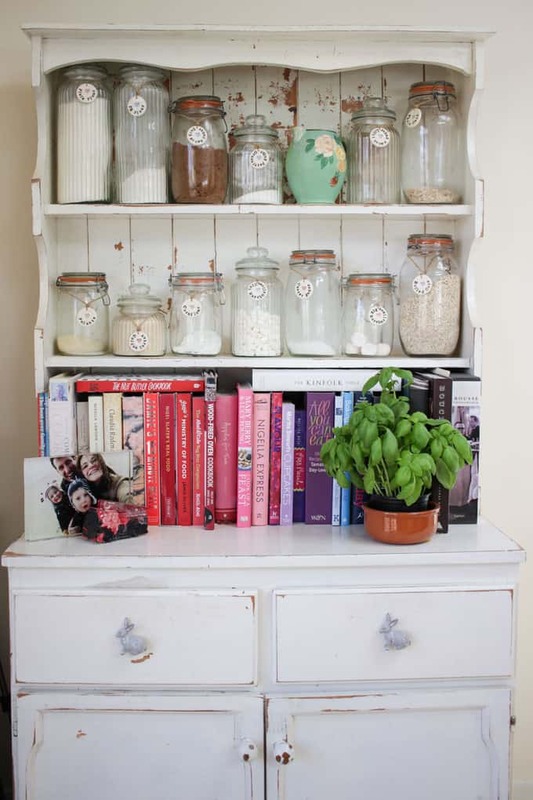 I realised that I LOVE looking at other people’s homes for inspiration and well, just to be a bit nosey, so perhaps I would share some photos and a video. The now grey kitchen units were a deep orange (!) toned wood for the first few years before we eventually took the plunge and painted them. I went on an Annie Sloan painting course to learn how to do it, but in the end, I gave in and paid a professional decorator to do it. I was so scared of mucking them up! I’m so pleased I did though as the finish was brilliant and they have lasted for over a year so far with barely a scratch. I would definitely say, if you’re thinking of painting your units, spend plenty of time prepping and undercoating to get a fantastic finish. It makes such a difference. Of course, we love the space and the natural light in the room so much but some of the little details also make such a difference to us. 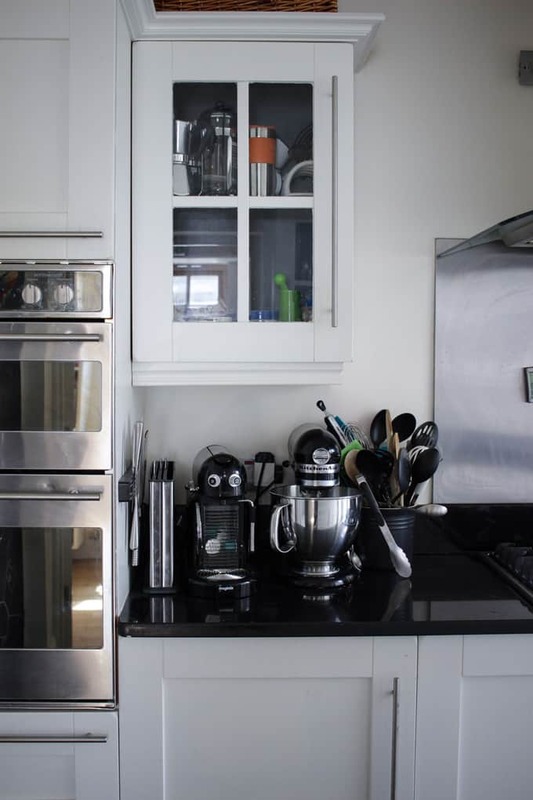 The fact that there are two sinks (oh hello, one to use as a giant cooler bucket for parties) and the mini breakfast bar at the end of the island unit. I’m so happy that there’s a little space that fits my old dresser perfectly, reminding me of so many memories of the other places that it has lived. I also love the little corners for my favourite gadgets tucked away but right at hand (Kitchen Aid Artisan and Dualit Vario toaster that I saved SO hard for). The light and the flow of space in this room really do make it for us. The work space in the kitchen is so perfectly suited to the way I cook, bustling about between the sinks, fridge and oven. It makes me so happy that the children can be playing and creating havoc in the playroom next door but still feel so much part of the space in this area. 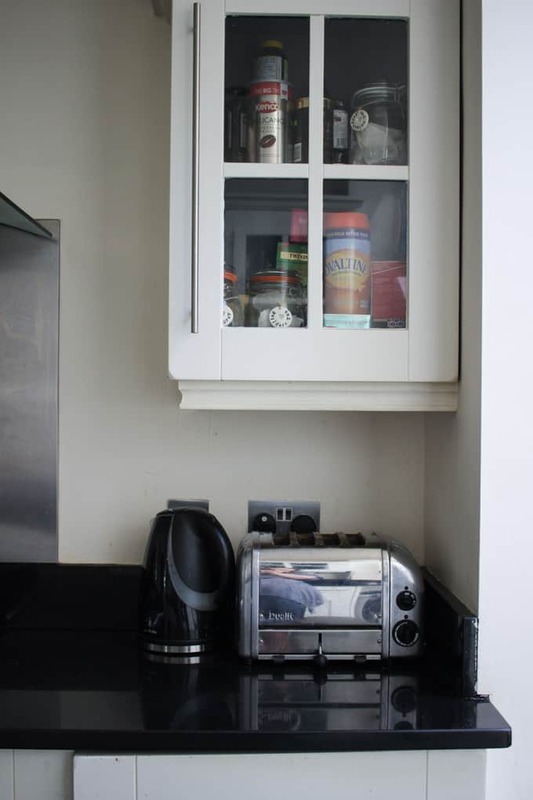 Oh and for the eagle eyed among you, we do have a microwave, it’s hidden inside a cupboard! 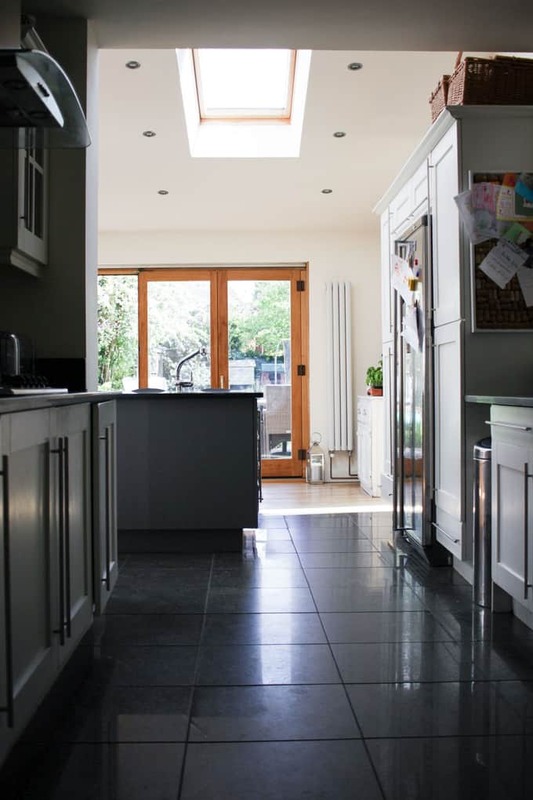 I hope you enjoyed the sneaky peak inside our grey kitchen. Thank you to Velux for prompting me to get around to finally sharing it with you. 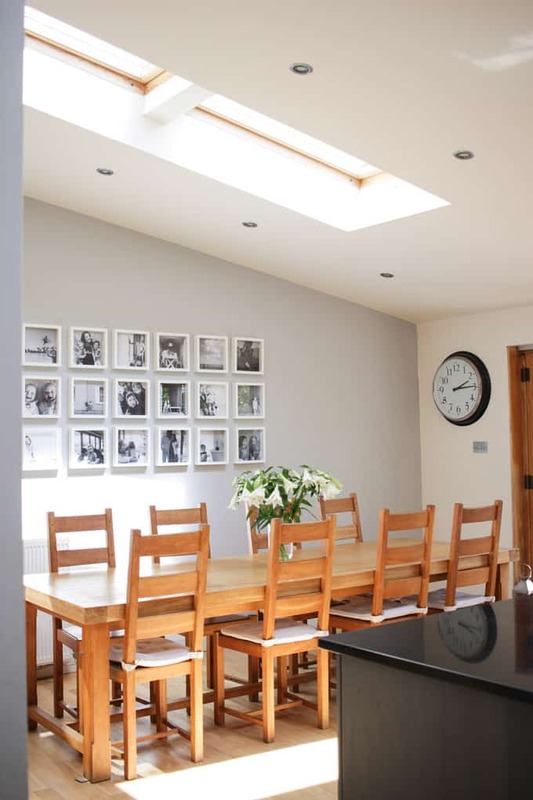 We love this space and VELUX roof windows let in twice as much daylight as vertical windows of the same size, making our kitchen feel even more spacious and homely for the family. It’s one of my favourite places in the world and I’m so grateful for this space every day. 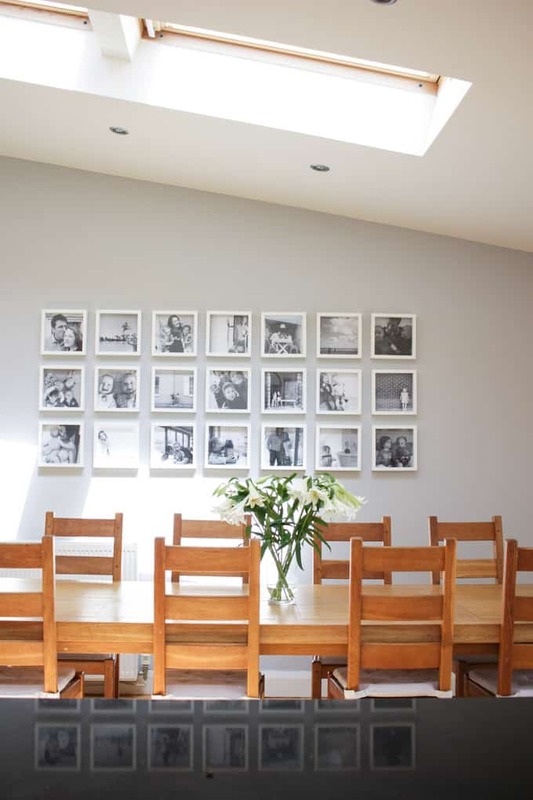 Disclosure: This post was written in collaboration with VELUX and their campaign to realise the #veluxpotential of your home. Thank you so much for sharing this. I love your kitchen. We have twins too and are looking to extend our house to create a bigger kitchen/living area. Your extension looks very similar to what we are planning but I’m finding it very hard to visualise the amount of space we are going to have. If it’s not too personal could I ask what size the extended part of the kitchen is? Thanks again. I really enjoy your videos. My twin boys are 18 months and it has been a whirlwind. Sorry I’ve been away, I’ll measure it at the weekend! So pleased you like the videos. Thank you!! Hello Sarah, I love the kitchen decoration. 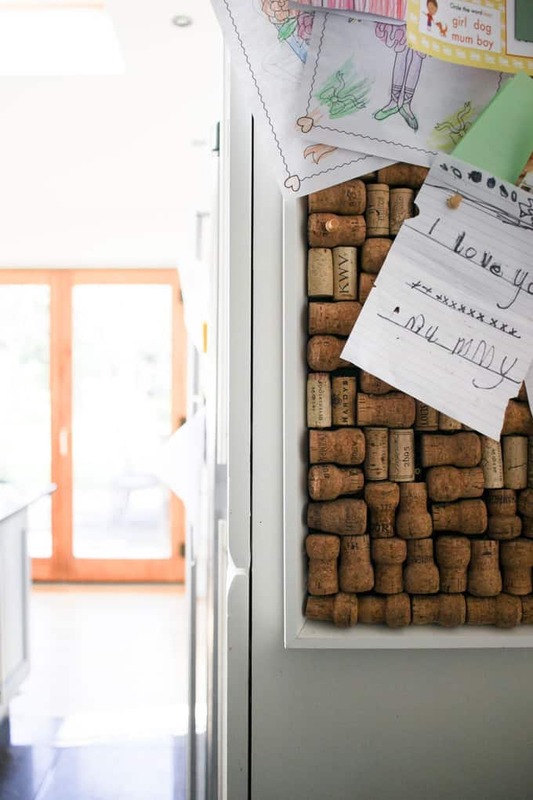 You have organised your kitchen room so nicely and well mannered. I love your thought. This is a helpful blog for women. Thanks for sharing such an informative post.